Skip to content Simply put our core value is Love; love of GOD, love of self and love of others. That is why we are and that is why we do what we do. "Because we are our sisters’ keepers"
The University of The Gambia and It’s Nice to Be Nice (INTBN) on Tuesday March 30, 2010 signed a Memorandum of Understanding (MOU) for INTBN’s adult literacy programme. Reproduced below is the full text of the press release issued after the signing of the MOU. On Tuesday March 30, 2010 at the University of the Gambia in Brikama, UTGSU and INTBN signed a MoU for INTBN’s adult literacy programme. It’s Nice to Be Nice (INTBN) international’s “Female Adult Literacy Programme” is targeted for disadvantaged or disabled females 18 years and upward who cannot read or write Basic English. The programme is free to participants. The organisation will provide the sponsorship for the programme. UTGSU will provide qualified and professional students as educators for this programme. 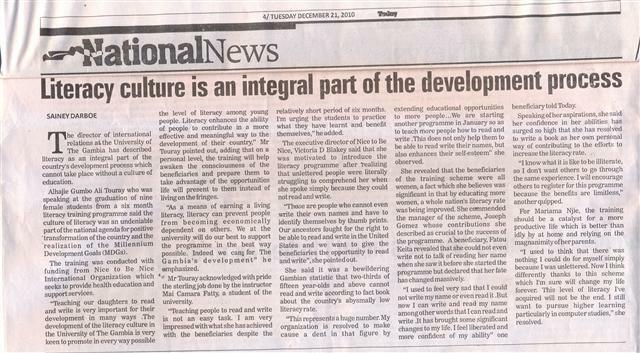 INTBN and UTGSU look forward to expanding this programme to other regions of the nation in the future. The classes will be held at Folanja School in Fajara. On hand for signing the MoU were Ms Victoria “Ndelle” Blakey, Chairperson/Executive Director and Mr. Joseph Gomez, IT Director/Manager of Gambian Affaris for INTBN and for UTGSU, Mr. Ousman Boyd Bojang, President UTGSU and Ansuman Darboe, Asst for the Director of International Affairs and information for the University of The Gambia. It’s Nice To Be Nice (INTBN) international is a non-profit charitable organisation that provides health education and education support services. INTBN has been registered in The Gambia since 2005. The organisaiton also has officer in Chicago, II, U.S.A. Those that can read are encouraged to inform females that meet the criteria to apply by calling 796 4488 and 989 9352 between the hours of 3:00 p, and 5:00pm on Friday or Saturday now through April 10, 2010. Calls about applying for the programme will not be accepted or entertained at any other hours, space is limited for this programme. In the news, 2016 Graduation is a hit!